Hop aboard one of Cabo's premier private catamarans, a 46' sailing trimaran that is perfect for groups of up to 60 passengers. 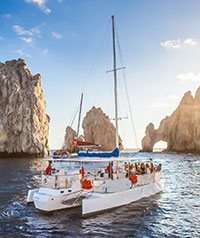 Whether you are looking for a sunset cruise for your group, a party or booze cruise, or perhaps snorkeling tour or whale watching, this Cabo San Lucas catamaran charter is just what the doctor ordered. You can cruise the Cabo San Lucas coastline in exclusive private comfort, anchor offshore beautiful beaches, sail past the glorious Land's end and the most famous landmark of Los Cabos - El Arco (the Arch), or stop for snorkeling in Santa Maria Bay, one of the best snorkeling areas in Cabo. Your crew is ready for fun, looking forward to showing you one of the best days or evenings of your lives. The wide-body trimaran style of this exclusive private boat gives a bit more stability than a typical 2-pontoon catamaran, and more deck space for its size. You also have comfortable bench seating if you prefer to chill out with a cocktail instead of dancing or participating in the onboard activities that are available. Don't forget to watch for whales from December through March, when mighty humpbacks are a common sight!